Jungle Red Writers: Snow What? HANK PHILLIPPI RYAN: It's snowing in Boston. Yeah, I know, it's December, whaddaya expect? But (because we're home) it's so pretty, and no scary, and not blustery. Just a gentle sweet little dusting of decoration from Mother Nature. Here's the cast iron colt we have in our side yard. He's life size, and my constant joy. Is it snowing where you are? Or what's it like outside your window right now? LUCY BURDETTE: Oh I'm envious of that first snow, does that sound silly? But I hated worrying about driving in winter--don't miss that at all. The front is passing through Key West now--rain, wind, and a 20 degree drop in temperature. All the tourists on Duval St. were wearing their plastic garbage bag cover-ups! 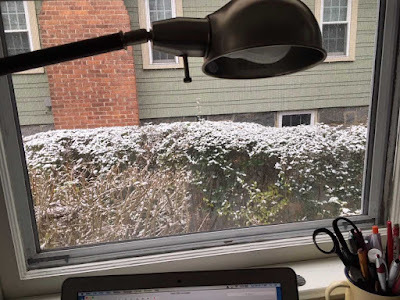 HALLIE EPHRON: Here's the view out my window - powdered-sugar snow. And it's coming down in big fat flakes like in a snow globe. JENN MCKINLAY: No snow in central AZ. I've only seen it snow twice here in the twenty plus years I've been here and then it never sticks. Snow is always magical to me! 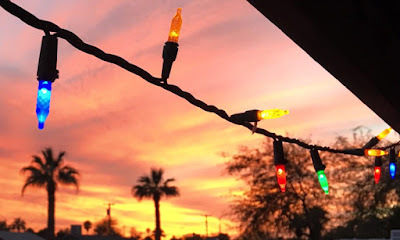 But since I can't have snow I settle for amazing sunsets and holiday lights - which I put up today! The view from Jenn's front porch! HANK: Wow. Amazing, Jenn. And look at this! By 8:30, the snow had not stopped! This is our back yard. And the bird bath is about two inches deep..so that means...how many inches? Reds, what's the weather where you are? ((And the winner of Jessica Strawsers's ALMOST MISSED YOU is Mary C! (Lucky you!) Email me at h ryan at whdh dot com to claim your prize! Snow may be pretty, but if I have to drive anywhere [or shovel it], I am not at all happy to see those white flakes falling. Today we've had snow all day, but not much of an accumulation, so I'm hoping the roads will be clear enough to get me to church and back safely . . . .
Let us know, Joan! Safe travels! Safely there and back, thank you. I'm in agreement with the chili/stew/soup folks --- good food for a cold day. Hank, it's definitely weird that my southern American on-line friends are getting snow, and we have NO SNOW on the ground here in Ottawa (Ontario). A major snowstorm is supposed to start Monday night (10-15 cm or 4-6"). The first snowfalls are pretty but when you have winter lasting for over 4-4.5 months, it gets pretty tiresome in the end. Especially when I am on cast/crutches trying to navigate an icy sidewalk and can't enjoy any winter sports such as snowshoeing or ice skating or group hikes this coming year. For those of you who love seeing snow, enjoy! Oh, Grace, maybe enjoy the snow a different way this year, with soup and movies on TV and getting very cozy. Do Canadians flock to the grocery like frightened vultures at the mention of snow? Ha ha, Hank. No, most Canadians do not go in panic to stock up at the grocery store. But there are cities like Victoria BC and even Toronto where the locals often forget how to survive in the winter. In Ottawa last year, we got over 300 cm of snow (9 feet), so I embraced snowshoeing and group hikes and ice skating instead of hibernating or staying indoors. But you're right that my winter survival plan this year will have to change due to my limited mobility until March. Lucy, I do have a specific warm weather goal in mind for late March. I am going to Reno for Left Coast Crime. And the plan is to go on some pre-LCC hikes with friends in Lake Tahoe and Nevada state parks (if my leg cooperates). Maybe not tropical weather, but it will be warmer than Ottawa! It was a lovely snow and it's a lovely morning up here on the NH border. But we tried to go out at six last night to a party in the next town and had to abandon the trip (in my little Prius C - admittedly not the best snow vehicle) - everybody was sliding around and it just didn't seem safe. I was happy to sit home and eat the pull-apart Christmas tree pizza thing I had made for the party and read and watch the snow fall. Edith, what a smart abandonment. Please tell more about "the pull-apart Christmas tree pizza thing". Who can be sure that we will not have more snow and want pull-apart pizza to enjoy during the storm? I saw your pizza thing on Facebook! It looked adorable… How did you do it? Thanks, Elisabeth and Hank! Yes, I posted a pic on FB. I used this recipe: https://www.southernliving.com/christmas/recipes/christmas-tree-pull-apart-bread-video. But next time I will space the balls farther apart and use less pesto inside. I had to cook it ten minutes longer than it said and still the inside balls didn't get done enough. But very tasty, and so pretty! Thank you, Edith, for the link and for the tips. That's looks delicious and so festive, Edith! Glad you didn't have to share it with too many people! The first snowfall is, indeed, a lovely thing. I always like to make a big pot of chili and snuggle in with a good book to watch it snow. This time, however, it just got cold in the Dallas area. All the snow went south of us, dusting San Antonio and Houston instead. Exciting for them, but very weird. Like Joan, I am long past the days when I thought I could drive in anything, including sleet and snow. I got caught out in a blizzard once when I was in college and that was quite enough. If the weatherman even mentions flakes in passing now, I flee for the house before it starts to freeze. But : chili! What a brilliant idea! As you may have seen, here in Atlanta we had 5" of snow which fell for 14 solid hours from Friday into Saturday! A record! A wonderful day to sit inside and read. Today is just bitter cold--25 degrees at the moment but no more snow. Snow in Atlanta! Amazing! . When I worked there, in the early 80s, it snowed one day, a surprising quick snow, and the city was paralyzed. People abandoned their cars on the highway, just locked them and left them. Ah, what a good place for me to be this morning. Also lots of snow here in western Connecticut canceling matinee performance of "Spamalot, Jr." (the 11 am show was a success), lasagna dinner, and today, church and caroling. What is best about being with this group is that I feel among kindred spirits -- if it snows, don't drive. A flake, two flakes and my car is in the garage, waiting for sunshine. There are some who LIKE driving in the snow, who seek out errands to run as the roads cover and visibility shrinks. Other than this bit of weirdness, they are wonderful friends and acquaintances. They think me equally weird when it comes to snow. Cheers for snowy days and good books. Oops, put the reply in the wrong place… See below, Elisaber! ! What man keeps driving when his newly-minted sweetheart is begging him to find a motel? Or perhaps he didn't suspect you had an ulterior motive, beyond getting off the icy highway? Warren would have gotten the hint right away. And, Lucy, having once accepted a ride with a "like to drive in this stuff", I understand the anger and the begging. First snow in Connecticut. So pretty. I was out and around during the snowfall, and even though I had to park a block and a half away at 9p.m. (snow plow regs), I loved walking in the dark with snow all around. I do not like ice, though!! I use a cane in this weather. Not a candy cane. Yes, Ice is a different deal altogether! A bit of snow here in upstate NY, less than 2 inches. Yes, I like seeing it if only it didn't have to fall on the roads! I've always been a reluctant driver and after getting caught in a sudden whiteout last year I'd be happy to never drive in snowy weather again. For those snow days that I know will be here soon enough I've got a 2000 piece jigsaw puzzle I am saving for when I can't go out and do much of anything. Those snow squalls are so dangerous! They come up so instantly, right? What is the puzzle of? Ir's called Family Vacation and it very busy - an old station wagon jammed packed with everything imaginable, in it, on it and spilling out. It should be quite the challenge especially since I've never done one that big. Oh, amazing! Good luck...incredible that you have the patience! In Quebec now, it is snowing gently. Not the first snow . The snowstorm Grace is awaiting will be coming our way after covering Ontario. Today, I'm happy to enjoy it while I can stay at home but, as I hate driving in the snow and have to go to work on Tuesday, I'll be nervous all day, wanting to go back home. And Hank, most of Canadians are used to snowstorms and are already prepared for the worst. It is so funny here in Boston… Shoppers descend on grocery stores like locusts, taking absolutely everything! It is almost hilarious. I live in mid-Michigan and I **love** snow! It's snowing right now: fat gently falling flakes, like a Christmas card. I'm indoors with my Christmas decorations watching the (electric) fireplace and the snow outside. It's so cozy and Christmassy! No snow here in Pittsburgh. Sunny yesterday. I see the sun breaking through right now, with a few flakes but that's all. We have intrepid friends who drove to us last night for dinner... The kids from down the block just finished shoveling us out. It's such a pretty snow. And weird that all the leaves haven't yet fallen so some of the trees are well and truly coated. Wow...That is certainly a testament to your wonderful cooking! I'm down right before the Cape so there was not much of anything on the ground that stuck around too long yesterday. It was a rain/snow mix. It made it a little interesting in the late morning when I was driving to Hanover for a comic convention, but cleaning off the car took about 30 seconds. By the time I got home, it was all rain. I woke up to a little more snow on the ground but it is rapidly melting as I just looked out my front door. So it was much ado about nothing for my particular area. Makes such a difference where you are! We’re an hour from the Cape, and got about four inches! I do love to see the pictures on here and on FB of all the beautiful snow. I wish we got more here in western Kentucky. It teased me yesterday with some spitting snow, but nothing on the ground. It is however, brrrr cold. I went on a Holiday House Tour of houses yesterday, some of the grand houses that open their houses for a our local Symphony fundraiser. This always gets me in the holiday spirit, even without snow. Today is cold and clear. I love holiday home tours, and your local symphony is certainly a good cause. It costs a lot to feed all those musicians! Oh, how were the houses? Any decorating tips? Snow makes everything look so pretty, doesn't it? At least for awhile. Then the yucky black stuff gets piled up, especially in places that get a lot of snow, and it stays there, drearying up the landscape, until the thaw. We had about a 1/2-inch yesterday, just enough to make it pretty, and slippery. We went to a holiday house tour walk in historic Seminary Square in Covington, Kentucky last night, and were slipping and sliding all over the place. But it sure was picturesque, with all those gorgeous 19th century homes, all decorated for the holidays. The older I get, the more I hate the cold. If anyone needs me, I'm in hibernation, okay? I'm like you Karen. I think I have bear's blood. I always feel like hibernating in the winter's months. The reason Canadians have no trouble with snowstorms is that they send them across the Big Lake to Rochester. So far however, they've kept it on their side of the border. We have a mere dusting today. I am envious of Hank's foot. Of snow, not the foot with the stiletto on it. This afternoon Julie and the St. Ann choir are singing Lessons and Carols. This is how Christmas starts for us. Tonight we will put up the tree, lights only, no ornaments, until we see how well the "Pet Corrector" aerosol spray works on keeping That Damn Cat from playing in it, climbing to the top and ripping off branches. We have a 500 piece (or so) creche we have collected thru the years, mostly Fontini. Eliot has precluded us bothering with it as she would happily knock every other figure off the mantle and into a dark corner. However I am longing for it, so, again with the pet correction spray, maybe we'll give it a try. Or I could just forget all the above and make sausage rolls. And little mince pies. And indulge in eggnog with Wild Turkey liberally stirred into it. Pet corrector? Send videos ! Cold for SW Florida - 48 last time I looked at the phone. We have fires in the kitchen and bedroom fireplaces and a frost warning for morning. I love snow - not the first ones though. I only like those from inside the house. Where I live, the first snows are heavy and wet. Later on in the cold of winter, they turn dry and powdery. Not so treacherous for driving. No snow in Toronto yet, though tonight's wether report suggests "a few flurries." And then the uncompromising word "Snow" for tomorrow. But hey, I've got my snow tires on and the shovels parked by the back door, and the brushes and scrapers in the front seat of the car. It's all good. 11:40 a.m. Snow just started. Here you go! xoxo Keep us posted..
We got snow in Houston Thursday night and early Friday morning. Just a dusting, really. But nice. It's been a few years since we've gotten any stick-to-the-ground snow. Since our neighborhood is in central Houston it tends to be slightly warmer than the outskirts so we sometimes manage to dodge freezes too. I drove on snowy roads for years in Ohio and Minnesota. It always amazed me that the drivers would try to drive as fast after the first snowfall. They were usually spun out on the side of the road. You'd think they'd learn! Houston and weather...how are you all? Breezy and warm here - upper 70's. As much as I normally hate snow, I'd gladly take it right now to help put out the fires. The ones closest to me aren't much of a threat any more, but there are others raging out of control here in So Cal. Mark, I have been thinking about you. I'm glad to hear that the fires closest to you are not a threat now. How is your brother's family doing? Here in southern CT we got about 4 inches of snow yesterday. I'm one of those people who can't stand to go out in it, and as I get older I'm more and more afraid of driving in it or walking in it. (Too many falls, and a fused spine!) So I was pretty frustrated yesterday being cooped up in the house. I couldn't even read, because I was worrying about getting out of the house today. When I left this morning to go to church the roads were icier than I expected them to be. Afterward, a friend and I went out for breakfast and I then went grocery shopping. By the time I got home, there had been a lot of melting. This afternoon I'm going to Lessons and Carols at church. I'm glad it's easier to get around this afternoon. I have an agreement with Mother Nature that there will be no more snow this winter. (She's probably not listening. These agreements always seem to be one-sided. ) I'm having arthroscopic knee surgery in about four weeks and I don't want to be worrying about slipping and sliding walking to and from my car at home and at work. Yes, I do not like or appreciate snow "in person". I can appreciate a pretty picture of it, though! Be careful! We walked to town center--it was rally lovely! But all the sidewalks are shoveled.. It's about forty degrees and, wait for it, sunny in Seattle! We do have an air stagnation warning so there is a weird haze/fog situation, but anytime we can see the sun, we'll take it. It's also dry, and thankfully, there is no snow. Seattle has a horrible track record with snow, and most of the residents are horrible drivers in snow. Let's hope the snow stays in the mountains. Bright and sunny, low-mid 30s and quite breezy here in Portland, OR. It's been dry for a couple of weeks, so the low temps are no problem, but if it rains by next weekend, we could have ice. That's a problem for us, as we live on a steep hill. Oh, Rick, ice! SO scary, and kind of hilariously (if you don't have to deal with it) impossible. So treacherous. Our driveway is a little steep, and it is always iffy. Here in central NC we had a few minutes of snow falling yesterday, and a bit of sleet and freezing temps, so we left the faucet dripping and settled in last night to watch A Room with a View. We can both almost recite it, but it's still such fun. This morning we got up and went to meeting with no problem. One of my bookstagrammer friends on Instagram mentioned there is no snow where she is. They have rain and she wants snow! Sometimes snow is easier than rain, right? Sometimes. This time the snow didn't lay so all good. When it does lay, the good part is that I'm on a major street that is plowed. The bad part is the plow puts a foot width of snow on the driver's side. Can't go back on the street so must be carried or pushed to the front or the back of the car. I really hate that! Snow is the back garden, however, is a winter wonderland. Oh, Sally, the plows! Can't live with 'em, can't live without 'em. Take care, okay?